As a crowd of about 200 chanted, "Shame. Shame on you" at guests entering the Vancouver Club, a line of police pushed back protesters who tried to surge against the club's front door. 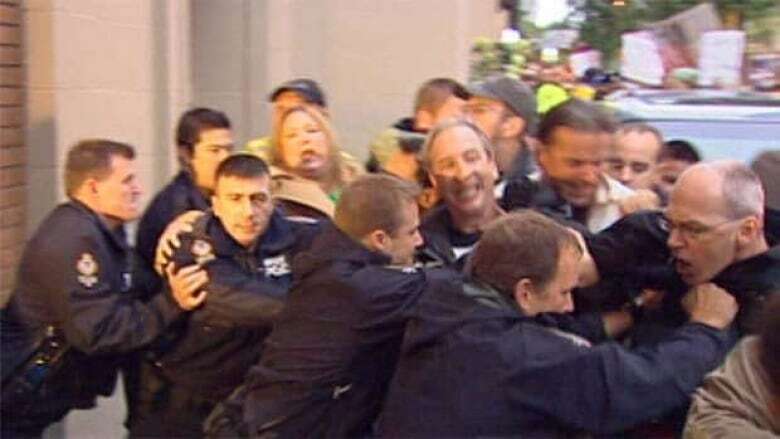 "One protester, a 51-year-old Vancouver man, was arrested for allegedly lunging at a Vancouver Club staff member and choking him, causing minor injuries. The protester was later released from custody on a promise to appear in court for assault, said Const. Lindsay Houghton. Some police officers later donned riot gear, including body armour, masked helmets and Plexiglas shields, but by that time, guests had already entered the venue. Some of the protesters held placards that read, "Cheney War Criminal," and "Torturer." Cheney was speaking at the sold-out $500 per seat event as part of a promotion of his book In My Time: A Personal and Political Memoir. The protest organizers with Stopwar.ca were demanding Canada arrest Cheney for war crimes because of his controversial support for the use of waterboarding, sleep deprivation and other methods to interrogate prisoners in the U.S.'s war against terrorism. "We're very angry that he has chosen Vancouver as the first location outside of the United States to do a book tour event, and we feel it's important that citizens of Vancouver show that we won't tolerate a war criminal coming and speaking in our town," said Derrick O'Keefe, co-chair of the StopWar Coalition. "We hope to set an example that Cheney doesn't see Canada as a safe haven." But Leah Costello, who heads up the Bon Mot Book Club that organized the event, said it's disappointing anybody would want to prevent Cheney from speaking. Do you trust political memoirs, including Cheney's? Have your say. "The most important thing in our club is that we're not endorsing or not endorsing the speakers we bring in. We bring them in for the point of debate and discussion," she said. Cheney's new memoir details his continued support of the interrogation techniques, which he called "critically important" to national security. "Should the president reinstate enhanced interrogation, including waterboarding? Well I certainly would advocate it," Cheney recently told Fox News. But Vancouver-Kingsway New Democrat MP Don Davies said Cheney should not even be allowed into Canada because those methods are considered torture. Davies said Cheney should be barred from Canada for authorizing actions banned under the Immigration and Refugee Protection Act. New York-based Human Rights Watch said Saturday that Canadian law provides for prosecution of an individual for torture and other crimes, even for offences committed outside of Canada. Cheney served as vice-president under George W. Bush from 2001 to 2009. He was also secretary of defence under George Bush Sr. from 1989 to 1993. P.O.V. : Do you trust political memoirs?